Inspired by the character design from Batman the Animated Series, Batman’s infamous nemesis Joker is finally joining Kotobukiya’s ARTFX+ line! Joker’s regal posing is befitting of the Clown Prince of Crime, as he stands confidently in his signature hat, grasping the muzzle of the machine gun at his side. 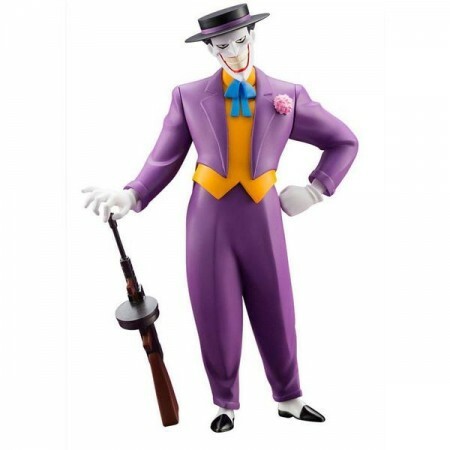 Joker comes with three interchangeable face parts depicting his characteristic grin, a sinister plotting expression, and a ticked-off expression, As a special bonus, two bonus face parts (lunacy and disappointment) for the matching Harley Quinn ARTFX+ statue will be included as well. His simplistic posing adapts easily to each of the varied expressions, allowing you to create your favourite version of the Joker, whether he’s planning sinister schemes or repeatedly being thwarted by Batman!